You may have seen the countless memes about trampling others for deals merely hours after saying thanks for what we already have. 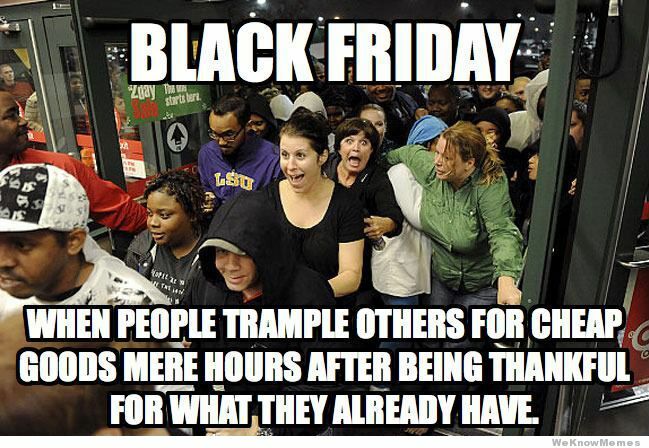 Yes, Black Friday can become an addiction. Yes, the deals are alluring. I’ve been there. I know what it’s like to spend hours with my aunt, whom I rarely see, in the wee minutes of the morning dressed in tactical gear on a hunt for the greatest deal of all time. Trust me. I’ve hidden on Kmart shelves, perched like a jungle cat, about to pounce on the next person that cuts me in line. I don’t care if it is my Kindergarten teacher. Now that I’ve seen the light of shopping small, however, I’m reminded of the Cars.com commercials where the buyers miss the drama in car-buying, so the salesmen create it for them. Let me lead you down the path of not just shopping small, but shopping simple. Sit back, take your time, sip some coffee from a Main Street store. Relax. In my recent quest to become the ultimate shopping small guru, I’ve heard many an excuse as to why it just can’t be done. Excuse me, while I scream into a pillow. You spend hours around a table after eating your turkey, searching, documenting, planning and mapping your quest for the best discounts, right? So why can’t you visit one or two stores that may be a few miles away? What if we spent that much time and effort thanking the people and small business owners of our communities? That brings me to the next excuse I often hear. Don’t give me that. But, for your sake, let’s say there really aren’t. There are way too many online options nowadays. To start, take a look at our Pinterest page and see what you like. There’s links to order from artists on our pins. If you find an artist you like, email them, visit their Etsy sites. It’s way simpler than getting in a punching match with a soccer mom on Black Friday for the last 5 percent off stuffed bear at a mega-chain. Below is a handy directory to help you find some small businesses near you. 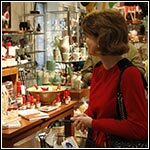 Make your shopping fun by attending special events at retailers known for carrying gifts handmade in Kentucky. 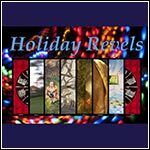 Kentucky artists adjudicated into Kentucky Arts Council programs will be hosting art tours and open studios as well as participating in exhibits and shows during the holiday season. 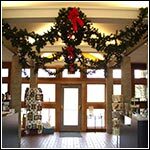 In addition to being a cornucopia for gifts handmade in Kentucky, the Artisan Center will have a busy schedule of artist demonstrations, book signings and musical performances throughout the season. Taking a break from the shopping holidaze might be the perfect therapy for getting in the spirit of the season. 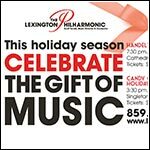 Check out this schedule of performances by Performing Arts Directory artists and at Kentucky Arts Partners performing arts venues. Use your time wisely this week. Start calling retailers (listed above) and ask about their holiday and Small Business Saturday specials. Chances are they’ll cut ya a deal. You just have to search them out, much like you would in a sales paper. Below is another way we’ve laid out a gift giving shopping guide to get you started. 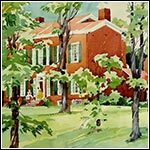 Paintings, prints, books and craft by distinguished Kentucky artists who have received the Kentucky Arts Council’s Al Smith Individual Artist Fellowship Award make the perfect gift for the art lover on your list. Remember, if when you find timeless treasures from a small shop, post it to Facebook, Twitter or Pinterest, and use #giveagiftky to show us what you found. Chances are we’ll re-post on our social networking sites.